Amid all the fanfare around the 50th anniversary of Moore's Law this year, there will be multiple references and notations from a brief article written by Intel co-founder Gordon Moore in the April 19, 1965 edition of Electronics magazine, which ceased publishing 20 years ago. It was the early days of the integrated circuit, and Intel was not even born yet when Moore, who was still at Fairchild Semiconductor at the time, was asked to contribute an article for the 35th anniversary of the magazine. In it, Moore pointed out that the number of transistors per square inch on integrated circuits had doubled every year since their invention. But, more importantly, he predicted that the trend would continue into the foreseeable future. "Integrated circuits will lead to such wonders as home computers or at least terminals connected to a central computer, automatic controls for automobiles, and personal portable communications equipment." In a short biography accompanying the article, Moore was described as "one of the new breed of electronic engineers, schooled in the physical sciences rather than in electronics." But his prediction proved to be remarkably accurate for the future of the electronics industry. Indeed, it became the driving force for exponential growth and innovation over the next five decades. While the article is known primarily for its prediction of the doubling of transistors, Moore also predicted how some of those transistors would be used in the future. "The future of integrated electronics is the future of electronics itself," Moore wrote. "Integrated circuits will lead to such wonders as home computers or at least terminals connected to a central computer, automatic controls for automobiles, and personal portable communications equipment." In 2005, at the 40th anniversary of Moore's famous observation, Intel realized that it didn't own an original copy of the magazine, only photocopies. So to raise awareness for the importance of the "law" and the seminal article that ended up guiding the industry, the company reached out to Moore, who had long since retired. "We checked around and asked Gordon if he may have had one, but he only had a photocopy," said former employee Howard High, a communications manager who worked closely with Moore, as well as other Intel CEOs Andy Grove and Craig Barrett, during his 27 years at the company. 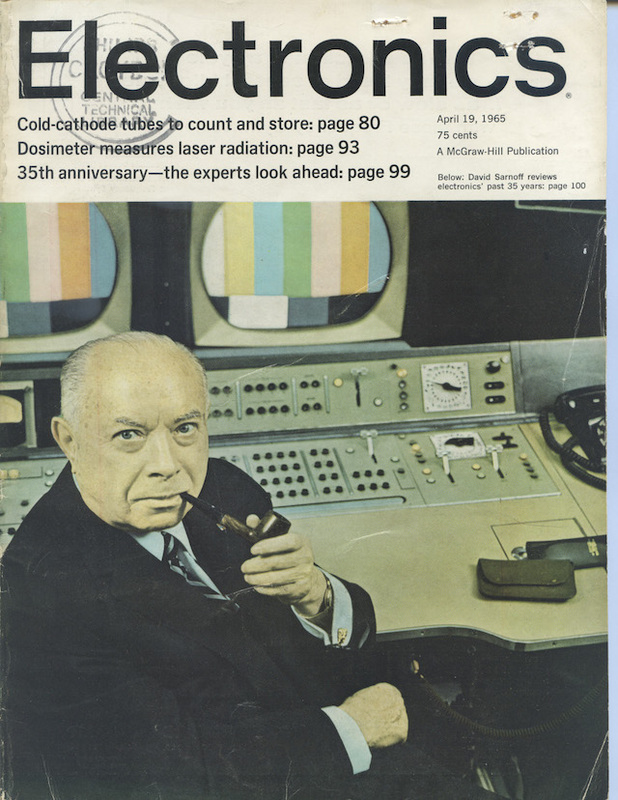 So the company went looking for an original copy of that April 19, 1965 issue of Electronics magazine. But not just any copy, said High. "We were looking for the best one we could find, either mint or excellent condition," he said, so that a key piece of history for the semiconductor industry could be persevered in the company archives. Intel put up a $10,000 reward for anyone who could come up with an original copy of the issue in question. The notice was posted on eBay using the auction site's now-retired "Want It Now" section. The posting, with a little help from Intel, also captured the attention of the media. "It was quirky enough that it quickly made the rounds and got a fair amount of attention in the geek world," High recalls. Unfortunately, many of the initial leads were either reprints or photocopies of the original. It also caused somewhat of a stir among various engineering libraries around the U.S., some of which reportedly put back issues of the magazine under lock and key, according to reports and comments on a few library mailing lists at the time. The earliest respondents had magazines that were in less than ideal condition, but just four days after word had spread came photographic evidence of a near-mint copy. A British engineer and self-proclaimed "hoarder" by the name of David Clark learned about the bounty from Slashdot.org and discovered he had a copy of the issue buried amid stacks of old magazines under the floorboards of his home in Surrey, England. In a brief ceremony at Intel's Swindon office in the U.K., Clark handed over the prized issue. Today, the copy that was once buried under the floorboards of a house in England is now carefully kept on the other side of the Atlantic in the Intel archives. Now 50 years off the printing press, the magazine is too delicate to flip through or even lay flat, according to Elizabeth Jones, manager of the Intel Museum and Intel archives. "The binding is very fragile," she said. "It's practically shredding, so we have to handle it very carefully." The original copy does not even get displayed in the Intel museum, a popular tourist attraction in Silicon Valley. It is managed and maintained much as a rare manuscript might be, in a climate-controlled environment, in an archival folder, in a special archival box. Jones is so protective of this important piece of history that she recently blocked an effort to have it travel for use in an internal video being shot with Moore at his home in Maui for the 50th anniversary. "I said it can go to Hawaii but I need to personally carry it," she said. "It's that important." It stayed in the archives. Ironically, Electronics magazine was first published in 1930 and was designed for "managerial and technical interests" but was never known as the kind of publication one would keep around, according to Moore in an earlier interview. High echoed Moore's assessment, and said the magazine was one of those 'throw away' trade publications you would read and then toss, not at all like a technical journal. This made it all the more remarkable that one in excellent condition surfaced 40 years after it was first published. High, a technology communications professional who lived a life of "sound bytes," said it was amazing that Clark had a copy in such fine condition. "You never know when an idea that is going to change the world will land on your desk, or line the bottom of your bird cage." Or fetch $10,000 and land in a museum.